christinakeim | Chronicles of a "Mini-Pro"
About a year ago, I attended a board meeting for an equestrian group; its leadership is populated with well intentioned, yet overextended, equine enthusiasts. We had set lofty goals for ourselves that season, few of which we had managed to attain. Our running theme throughout the meeting was that in the upcoming year, our new goal moving forward was simply to “do better”. It became both an excuse and a plan of attack. As a result, the notion of “doing better” was something I thought about all last year, in a broader context. Many of the most pervasive and pressing issues facing the equine industry at this time boil down to needing better education, better awareness and better advocacy. In order to move towards resolution on messy, complicated problems such as the unwanted horse crisis, loss of open space, unqualified instructors, ignorant but well-intentioned horse owners and an overall lack of understanding of horses by non-horse people, we as equestrians must do better, in many facets and iterations of the concept. I could probably do a better job of grooming Nori. And here we are, already nearly a third of the way through 2019, and for various reasons I am left still ruminating on the same theme. At the US Equestrian Federation meeting in January, I attended a panel discussion focusing on the needs of the grassroots. Most at the table defined “grassroots” as being riders who have some experience, maybe compete at local level shows, and who see issues such as cost, exclusivity and accessibility as being barriers to their participation in competitive sport at a higher level. As leaders of the USEF, it is not surprising that their definition of the grassroots is competition centric. But I would like to take it even further. Turning to Google Dictionary, the definition of “grassroots” is as follows: “the most basic level of an activity or an organization; ordinary people regarded as the main body of an organization’s membership.” Using this definition of grassroots, are we not talking about the vast majority of horse people? Most equine groups draw a pyramid to represent their membership; a very small percentage of members are at the elite level represented by the narrowest part of the triangle at the top, while the vast majority is competing, training or enjoying their horses at levels closer to the bottom. I don’t like the word bottom though—I think a better word is “foundation”. Because without these riders, horse lovers, trainers, coaches and fans, THERE IS NO ELITE EQUESTRIAN. It simply cannot exist. Nothing beats a ride with good friends. I firmly believe that as a sport, as an industry, equestrians are in trouble, because the base is no longer on steady ground. There are several reasons for this: constantly increasing expense, loss of equestrian lands and expanded gentrification are surely a huge part of it. But I also think that equestrians as a group still continue to allow the differences between our disciplines to divide us, rather than work towards allowing our mutual love and admiration for the horse to unite us. In 2017, the American Horse Council repeated its economic impact study of the horse industry, and they came up with some impressive figures. $50 billion direct impact to the U.S. economy. 32 million acres of land owned and 49 million acres of land leased for horse-related uses. 7.2 million horses in the U.S. But perhaps even more telling is that of those 7.2 million, almost half (3,141,449 to be exact) are used for recreation. If we were drawing that pyramid, here is our industry’s base. Our foundation. But how many horse owners and horse lovers are finding themselves priced out of the industry? Even on a shoestring, keeping a horse is not cheap. For many grassroots horse owners, there is sacrifice and choice involved in owning their animals. I have a lot of respect for that, because that has been my personal experience too. In order to make horse ownership a reality, I have always been in some combination of management, rough board or working boarder situation. I also have been blessed to know some exceedingly generous farm owners who were willing to let me and my horses into their lives and barns. “Where there’s a will there’s a way” may be cliché, but in my experience that plus a little bit of luck and a willingness to work hard has made opportunities happen. It can be hard to clean up the paddock when its resident insists on sleeping in the poo. I know firsthand the passion which many of those at the grassroots bring to their equestrianism. And I would like to respectfully suggest that as horsemen, we do a better job of acknowledging that any time a horse is in a situation where he is well cared for, sheltered and loved, it really doesn’t matter whether they are an elite athlete or not, whether they are living up to someone else’s agenda, whether they are wearing mismatched bellboots and a hand me down blanket. It doesn’t matter if the owner’s goal for the season is to make it to the area finals, to go to a schooling show series, to attend clinics/lessons/camps, to learn to canter, to hack on the trails or to simply spend time with their horse and work on the ground. It doesn’t matter. We need to do a better job of recognizing that what all equestrians bring to the table should be a love of the horse. I would like to humbly propose a list of ways in which we can “do better” — for ourselves, for each other, and for our horses. I bet you can add some other ideas too; please post them in the comments. When it comes to doing better, there is no easier place to start than with ourselves. Doing better could be as simple as finding an instructor you connect with and taking a weekly lesson. It could be committing to riding three days per week. Cleaning your tack more often. Prioritizing your riding and your goals and learning what that means for scheduling your life around this objective. Simply spending time with your (muddy, heavily shedding) horse can be its own reward. Join a horse club. Pick one that means something to you—a breed society, a discipline organization, the local trails group. Contribute to groups which keep trails open, allow horse camping, protect open space. Support a rescue whose work makes sense to you. Donate your unused equipment and supplies to someone in need. Be a part of the broader equine community. Commit to your own continuing education. Even the best in the world do this so we mortals are certainly not exempt. Read a book (check out my many book reviews for some inspiration!). Watch a video. Follow someone on YouTube. Go to a clinic. Keep your mind open. If you are a coach or trainer, question your credentials. Get certified. Become a mentor. Be a role model that a developing equestrian can look up to. Always, always respect the animal. I make it a goal to attend as many clinics as I can each year, about a range of topics. Here, Jochen Schleese discusses saddle fit. When you are at the barn, put your phone away. Don’t be checking your social media and emails when you are supposed to be enjoying your horse and his company. That’s just rude. Stop waiting for someone else to show you the way, to organize the trail ride, to get you to a clinic or show. Smile at the child who wants to pet your horse and teach them how to do so safely. Set your goals, break them down, and start achieving your dreams. This year in New Hampshire, a local state representative proposed a bill which would have required that animal owners, including equestrians, clean up any waste left when in a state park or forest. This is not the first time a “poop bill” has been proposed in our state, and as a result, there are already administrative rules in place that mandate the cleanup of trail heads and other common areas. Trails, though, are exempt. Equestrians and dog mushers banded together in opposition, and the proposal died in committee at the beginning of this month. I was actively involved in letter writing, petition signing and otherwise trying to get the word out to local equestrians about the risk posed by this bill to reasonable trail access. And there were two things which really struck me as a result of this process—first, the disconnect between horseback riders and non-horse people is continuing to grow. Second, equestrians need to become more proactive in advocating for ourselves, and this means not sitting back and waiting for someone else to lead the charge. Are you an equestrian? Then the someone who needs to do something is YOU. For any horse related event or activity to occur, there are hours spent in preparation, usually by volunteers. Be sure to take your turn! In online forums and in response to newspaper articles discussing the proposed bill, non-equestrian comments ranged from mildly indifferent to scathing. I was disturbed to read a number of comments which tended towards sentiments such as “equestrians need to get off their high horse and clean up their s&%t” or “equestrians are entitled and just think everyone else should have to deal with their manure”. Other common themes reflected an overall lack of understanding of horses and the logistics of riding in the open, such as the challenges associated with mounting and dismounting safely on trail, horses’ general aversion to wearing poop bags, and the difficulty of carrying clean up equipment on horseback. We defeated the bill, this time, but I know it will be back. And I fear that there will come a time when due to a continued shift in demographics, a sense complacency in the equine community and/or other unforeseen factors, that we will not be able to win. But it doesn’t have to be that way. As equestrians, we need to do better to unite with other trail users (snowmobilers, mountain bikers, hikers), land trusts, conservation commissions and state land protection agencies. We need to educate them about what horses are and are not, and we need to do so from a place of compassion. We need to volunteer to maintain trails and police other equestrians who use them. If competition is more your thing—then become active with a regional show organization. Volunteer. Thank your organizers. Support local and regional shows. I have a lot of thoughts on this subject too—you can review them here. The bottom line is, we need to do better in reaching out to our local communities to educate them about the amazing benefits which horses can bring to an area. Therapeutic programs offer recreation and cognitive, physical and emotional benefits to the differently abled, victims of trauma, and our veterans. Lesson programs give young people and adults an opportunity for wholesome fun, exercise, the chance to be outdoors and all the many benefits which come from learning to be a horseman. Farm owners contribute to the local economy both directly and through support industries like veterinary medicine, farriery, hay production and more. Horse farms help to preserve open land. Most people are not raised around horses anymore. Sometimes they have unusual ideas of what it means to be a horseman. Yet in the American Horse Council study, 31% of American households identified as having a horse lover within them. Horses still possess a mystique, a unique draw which calls humans to them like no other species. We need to do better to encourage those horse lovers to stay connected and to allow for opportunities for community members to safely interact with our animals. Humans instinctively fear or oppose things which they do not understand. All it takes is one positive interaction for someone to have a new level of understanding and appreciation for the horse. If this blog feels a little preachy, or a little bit soap boxy, well, I suppose it is. But for me what it comes down to, always, is our horses. I want to see our industry continue to thrive decades into the future, beyond my lifetime. I want so much to know that all horse crazy young people will have a realistic chance to enjoy all that comes with interacting with these amazing creatures, that the privilege will not become reserved only for those whose resources already allow them access to everything else. I want to ensure that we will all continue to have places to ride, both in and out of the arena, which are safe and beautiful. I want to believe that horses will continue to have a place to exist and be a part of our ever-evolving world, one where they are valued simply for being horses, not because of what they represent in status or competitive success or ego. So again, I ask you, I ask myself, I ask all equestrians—what can we do better in 2019? And in the years to come? Disclaimer: The views contained within this blog post are solely my own. I do not intend to speak for the other staff of the University of New Hampshire Equine Program, its students, volunteers, or other affiliates, who may well see things quite differently. I am merely using my experience as the manager of the UNH Horse Trials to inform my perspective on the continued loss of competition venues in eventing. At the US Equestrian Federation meeting in West Palm Beach, Florida, I attended an interesting panel discussion: “Growing the Grassroots”. This presentation featured the work of a panel which included representatives from several USEF affiliates and disciplines. Bill Moroney, CEO of the USEF, facilitated the discussion, and he opened with the statement that “a majority of the USEF membership feels they are part of the grassroots.” This large group of riders mostly avoids competing at rated shows due to any of a number of barriers—cost, exclusivity and accessibility being among the most significant. The Grassroots Panel…photo “borrowed” from the USEF Annual Meeting e-newsletter emailed to members, uncredited. Like the Fiji water girl, I am in all of the photos… my profile is in the middle, looking left, with the glasses. Proof I was there, lol! One panelist commented that local shows (which are often unrated) are doing well, and the upper levels are doing well, but there is a serious lack of opportunity in the middle levels—and this is where we are losing riders. The middle is the land of the one day rated horse show; when I was a kid, these were the “C” and “B” shows, where you were able to log miles and trips and hone your craft in the show ring, without the budget and time commitment of going to a week long “A” show, but with the pressure that comes with an increased standard of riding. Although most of those present were speaking of the hunter/jumper scene, I couldn’t help but think about the sport of eventing. In 2018, 28 horse trials were cancelled, reducing the number of starters by over 3,000 rides. Though some of these cancellations were due to weather, many more are permanent losses to the eventing calendar. Here in Area I, we have lost Stoneleigh Burnham (which hosted twice per year), King Oak/Grindstone Mountain (King Oak used to host two per year, and the new owners tried it in 2017 but threw in the towel in 2018) and we have just recently learned that for 2019 we also are losing Fitch’s Corner in New York and Riga Meadow in Connecticut. Collectively, this represents over a century of eventing in the northeast. Losing these competitions impacts the bottom line of the US Eventing Association, which collects a starter fee for each ride, but more importantly, it is eroding access to local, one day events. You know, the ones where you log your miles and hone your craft and learn how to compete under pressure. These events are the bridge between schooling trials and premier, destination competitions. I have been managing the University of New Hampshire Horse Trials since 2006; we are the quintessential “middle” competition, a stepping stone from the growing schooling eventing circuit to larger, more prestigious events in the region. Our competitor base is largely local, coming from within a two hour radius, along with a handful of riders from further afield. UNH hosts two events per year (spring and fall), and for five years, we ran one in summer as well—to help replace yet another event lost to the Area, Kingsbury Hill. Since Kingsbury Hill was sold, UNH has remained the only sanctioned horse trials in New Hampshire. When Snowfields stopped running, Maine lost its only sanctioned event. 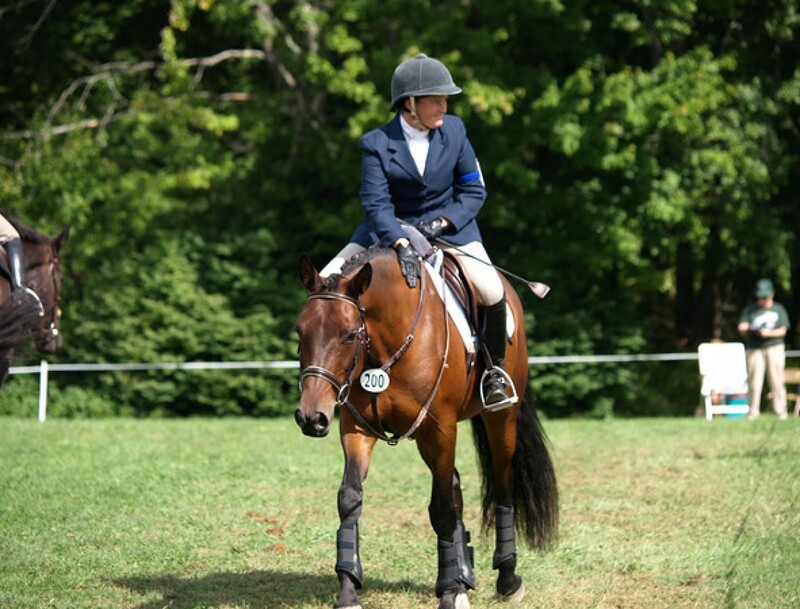 For those event riders in Maine or New Hampshire, save for UNH, you have to travel to Vermont, Massachusetts or New York to compete at a USEA horse trials. Most of these losses have happened within the past 5-10 years. The answers are fairly consistent: to promote the program, to give students a chance to learn about how to run a horse show, to make money. And most of these reasons are true, save for the last. It is an unusual show in which we actually turn a profit. Our goal is to break even—because truly, for us at UNH, hosting the horse trials is mostly about giving our students a living laboratory, a chance to get behind the scenes and to ‘learn by doing’ all that goes into organizing and running a horse event. We use the horse trials as a model; using similar skills, students could go on to coordinate any number of equine related activities. Plus, the experience of running a committee is a real resume booster, full of transferrable skills: organizing, communicating, delegating, meeting deadlines, coordinating, following organization rules. I hope you can tell how incredibly proud I am of the work that our students put into these competitions. Acclaimed international course designer Richard Jeffries joined UNH students and staff to design the courses for our 40th anniversary horse trials in 2011. Truthfully, I have no way of knowing what exactly motivates these landowners, but I sort of suspect it comes down to a deep seated love of the sport, and a desire and willingness to give back. People take pride in their properties, and I believe that many of them truly love watching others enjoy them as well. We competitors are just invited guests to a party. Let’s face it—no land owners + no organizers= no more eventing. To that end, we have to keep organizers happy. We need to be better guests. Collecting the decor for our horse trials frequently requires the creative use of local resources. It seems trite to say that running a farm is hard work. Maintaining a cross country course can almost be a full time job itself; it feels like you have no more finished mowing and weed whacking than you turn around and have to do it again. Mother Nature is always out to reclaim that which she considers hers. Water complexes become clogged with weeds, wooden fences rot and decay. Footing becomes compacted and worn away on trails as roots and rocks rise up. Trees fall, blocking routes and sometimes destroying jumps. I come back to my earlier point; to do this much work on a private farm in order to run a competition a handful of times per year, one which is most likely not going to make you money and might even cost you—it is a labor of love. The event at UNH is unique for many reasons. It is the only recognized event in the country held on a college campus. It is nearly wholly coordinated and staffed by students, very few of whom would call themselves eventers. They come from myriad equestrian backgrounds: horses at home, 4-H and Pony Club, breed specialty programs (we are the land of the Morgan Horse, after all), dressage, western, therapeutic horsemanship and of course, hunter/jumper. Some have shown, some have not. Some have volunteered before, some have not. Many have never in their lives been handed a clipboard and a radio, been trained to do a job and then told: you are now in charge. They are emergent leaders. They are your future boarders, clients and friends. They are equestrians. Still smiling, despite moving 20+ heavy standards and countless rails! Show Jumping Committee Chairs in Fall 2018. Volunteers, like organizers, choose to offer their time and talents for myriad reasons. Just like organizers, if they are not getting what they need from their experience, they are unlikely to do it again in the future. Our students are not volunteers in the strictest sense—they are required to participate in the horse trials as a course expectation—but like volunteers, they are trying to fit competition preparations into their very full schedules. They have classes, homework and exams, jobs, family commitments and personal lives, just like all of our competitors. They are up early, giving of their time and energy, setting up courses in the rain and then running to an exam, coordinating a dressage warm up before their peers have even gotten out of bed. In between writing her grad school applications, this student committee chair made sure our cross country course looked sharp for the fall event. How many rails did we need per side again? Maybe I just take these comments so personally because I know, first hand, how hard our students work to put this event together. For some, it is a steep learning curve, and when a phase is first getting under way on the first day, and people are figuring out their jobs, are there some hiccups? Sure. But the officials, full time program staff and student leaders are right there behind them, offering them support, helping them figure it out. Our students are not lazy and they are not inattentive. They are learning, and most take their duties quite seriously. They are volunteers. This group readies the start box for a spring event. I should add here that we receive positive evaluations too, and a handful of emails or notes thanking us for hosting the shows. I am always sure to share these with our students and staff. But the hurtful ones leave a sting that can be hard to forget. When Stoneleigh-Burnham School, our sister event out in Greenfield, Mass., was forced to cancel their 2018 summer competition on the morning of the event due to excessive rain, my heart broke for them. So much time and effort, and money, was spent for naught. This private girls’ school has an equestrian program, but their focus has become primarily hunter/jumper. Like UNH, SBS has run an event for decades, on its campus, the cross country course wrapped around soccer fields and tennis courts and its main dormitory. Like most schools, it doesn’t have a generous margin of error when it comes to its budget. Within hours of the competition cancellation, while some of its entrants were no doubt still making their way back home, having already begun their trip to the foothills of the Berkshires when they got the news, the posts started on social media. “When are we going to get a refund?” snarked one competitor. “I don’t have the money to lose on a cancelled competition.” Others chimed in. Many defended the competition and understood that this was a lose-lose situation. But the fire was lit, and some threatened to never enter the event ever again, accusing organizers of keeping funds which should be returned to competitors (contrary to the omnibus listing, which clearly stated no refund in event of cancellation). Within two months, Stoneleigh announced that they were done with eventing for good. And not one in pajamas. Here’s the thing folks—if we want our “middle” eventing competitions to survive—organizers need to break even, volunteers must be treated with respect, and competitors need to say ‘thank you for inviting us’. We are all in this together. “Middle” event staff and volunteers work hard and invest time, money, energy and love into presenting a quality, safe competition on a budget. We want our competitors to have fun, to meet their goals, to be challenged reasonably for their level. We take constructive feedback seriously, and over the years many changes to the format, layout and coordination of the UNH event have been the direct result of competitor feedback. At that Grassroots round table, the panelists stated that in the hunter/jumper industry, the middle of the sport is in a bad place. There is no incentive for organizers to run local, one day recognized shows, because trainers don’t come; instead they take their clients to the high end shows, where they can camp out for a week or more. The clients which can’t afford it either bankrupt themselves trying, drop back to the schooling level or leave the sport. Eventing must take this warning seriously. When events go off the calendar, they don’t seem to come back. There just isn’t a long list of new facilities and land owners clambering to get a spot on the schedule. Isn’t this what is all about? Camaraderie, fun, friends, and enjoying our horses. It benefits ALL of us to ensure that people who start in our sport stay in our sport. We want people to be lifelong equestrians, which means they need to have good experiences, and this includes our volunteers and organizers. As a competitor myself, I appreciate that when we are under the pressure of a show, we are not always our best selves. I warn my students about this and I can forgive a sharp word or two. But please, before you hit send on that snarky competitor evaluation, take real stock of what it is you are trying to say. Are you offering help, or are you just complaining? Is your intention to make yourself feel better or to genuinely improve the quality of a competition? Perhaps outgoing USEA President Carol Kozlowski said it best in her “President’s Letter” in the Sept-October 2018 Eventing USA, in regards to organizing, “It’s a tough job even when things go well, and it quickly loses any appeal when an unappreciative audience runs amuck,” writes Kozlowski. She then encourages competitors to reach out to organizers to thank them for their effort and say you are looking forward to their next event, even if the show had to be cancelled or something didn’t go smoothly. If being an organizer has taught me anything about how to act as a competitor, it is the importance of being grateful for the opportunity to even be there in the first place. Please listen to her. I promise it makes a difference. The future of our sport may depend on it. c 1993 and 1996 Mountain Press Publishing Company, Missoula, MT. 366 pages. This slightly older book is a worthwhile read if you are someone who enjoys spending some time devoted towards introspection and dissection of your motivations and goals– sort of a perfect way to start off a new year in the depths of a New England winter! I first came across this book on the shelf of a Pony Club library in Racine, Wisc. ; it was during a time where I was reassessing goals and priorities within my own horsemanship journey, and so the intersections of personal perspective, goal setting and philosophy discussed in the book were intriguing to me. I found a copy through the useful website Alibris.com—they network with used book stores across the country and can generally track down any title at a reasonable price. I would recommend them highly! This book seems to have been written as a labor of love by Jill Hassler, who after its publication remarried and hyphenated her last name to Hassler-Scoop. Hassler-Scoop, who passed away in 2006, was a passionate educator, former manager of Hilltop Farm in Colora, Md., and founder of several Pony Clubs, among many other accolades. She was known for her positivity, commitment to family and friends, and her deep and abiding compassion for her horses. All of these qualities come through in her writing in In Search of Your Image. As a fellow educator, after reading this book I wish I could have sat with her for a cup of tea and a discussion of our role as mentors and guides. Upon reading it, I discovered that this book is a sequel to her Beyond the Mirrors, and she wrote it as a “step by step approach to help animal lovers discover ways to know and accept themselves through their love of an involvement with horses” (Hassler-Scoop, p. ix., 1993). Her intention is to guide readers through a process of self-discovery; to unlock what it is that matters the most to them about horses, but also how those objectives mesh (or don’t) with other important aspects of life. A deeply private person, Hassler-Scoop reveals portions of her own journey with horses, and how they have guided her, helped her, and healed her. She also shares some stories of her students, and how she used her role as teacher/mentor to guide them along their own paths to self-discovery. Jill Hassler-Scoop, photo taken from her obituary. I think what most struck me, as I read through the pages, is that though this book is focused on horses and goal setting and motivations, it isn’t really, at the end of the day, a horse book. It is more about causing the reader to reflect on spirituality and on their mental state of being, and how these beliefs intersect with their relationship with horses. Further, these same qualities will affect the relationship the reader has with other people and activities in their lives. It is part self-help, part sports psychology—but published before such a term and concept was fully en vogue. Overall this book is worth the read—but it is dense. This isn’t something which you will pick up, breeze through, and throw onto a shelf. To really do it justice requires taking the time to read each chapter slowly and with care, and then set it aside to let the ideas simmer for a bit. Truthfully, it took me years to finish it—so long that by the time I reached the end I scarcely remembered the beginning, and even if I had, I was a different person by the time I got there and would likely have brought a whole different lens to my reading. Really, isn’t the bond we have with our horse what it is really all about? There is apparently also supposed to be a work book which the reader uses to complete various self-assessment tasks during the reading; I did not have access to this but I suppose it might be possible to track one of those down as well to support the read. I would imagine that the people who most need to read this book are the people who are least likely to do so—because it will most appeal to the reader which is already inclined to be reflective and thoughtful, to the person who will turn their focus inward anyway. But if they can find an additional degree of understanding through its words, I suspect that Hassler-Scoop’s legacy as an educator will remain intact. c 2018 Trafalgar Square Books: North Pomfret, VT. 376 pages. Most newly published authors do book tours—but for Tik Maynard, author of the 2018 memoir In the Middle are the Horsemen, it somehow seems appropriate that he has instead been doing clinic after clinic up here in New England, offering guidance not just on riding but also ground work exercises for horses of all ages. I’m not really sure how well known he was up here before giving a keynote speech at the Area I Annual Meeting in January, but after this year, you would be hard pressed to find a New England event rider who hasn’t at least heard this Florida based trainer’s name. Maynard’s approach to training is positive and pro-horse. It is fair and it is humane. And what he has been able to do so successfully is fuse the perspectives of trainers who are from the “classical school”, who are usually focused on producing animals for sport, with the viewpoints of trainers who are from the “natural horsemanship/cowboy school”, whose training objectives tend to be more utilitarian. This book chronicles Maynard’s journey to get to this place. I first became exposed to some of Maynard’s ideas through an article he wrote for Practical Horseman, in which he detailed ground work exercises for event horses. I was struck then by both his thoughtfulness and introspection in the descriptions he gave of the work and rationale. I enjoyed the piece so much that I pulled it for future reference, something I would suggest doing if you come across his articles in the future. Izzy and I had the opportunity to work with Tik at a clinic at Fox Hill Equestrians in Barnstead, NH, in May 2018. Normally I don’t expect that someone who is only in their mid-thirties has really lived enough life to warrant writing their memoir, but in this case, Maynard has done a great job of focusing his story on the years that followed a cross roads in life which most readers (and riders) can identify with—picking up the pieces when the direction you thought your life was going doesn’t pan out. Maynard chose to take advantage of this unsettling life phase to become a working student, and aimed for the top. It is through his three years of experience as an underling to some of the best equestrians in the world that we watch a young man turn into a truly independent, self-confident adult who believes in himself and his training philosophy. This book is an easy and engaging read. Maynard writes in a clear prose and with the wisdom of being able to look back a decade later on his experiences, he is able to offer deeper insights into his motivations, his thought processes and the lessons that he took away from it all. As he moves from one apprenticeship to another throughout the story, the reader can almost feel the growing pains he experiences as he works to integrate new knowledge and understanding with preconceived ideas and beliefs. What is perhaps most impressive is that Maynard lets us see his journey in full resolution—unlike some memoirs which only focus on the positive highlights, In the Middle are the Horsemen travels through the potholes and valleys, the moments of darkness and self doubt, the times where choices made had unexpected, negative consequences. It is perhaps because of this honesty that the other elements of the story have greater resonance. Overall, In the Middle are the Horsemen is a worthwhile read, enjoyable and insightful, funny and engaging. I suspect that there is something in here which most readers—both equestrians and non—will connect with. Perhaps it would make the perfect gift this holiday season? Proper saddle fit is a topic which has garnered much attention as equestrians have gained a better understanding of the intersection between tack and performance. Jochen Schleese, of Saddlefit4Life, is a saddle maker who is inspired to educate riders, owners and trainers on the basic concepts of better saddle fit. He gave a lecture and demonstration on the subject at the University of New Hampshire Equine Program in September of 2017, and the following is a brief summary of his critical points. Several trends in modern equestrian sport have influenced the needs we must address in the design and selection of saddles. First, most riders are female, and the structure of their pelvis is different than that of a male. Female hip sockets face more forward, a shorter tail bone brings the balance point of the pelvis further forward and the seat bones are wider. However, saddle design traditionally has been oriented towards what will suit a male pelvis; when women try to ride in saddles which do not allow them to naturally sit in a comfortable, supported position, they at a minimum feel like they ‘fight the tack’, or in the long term, can suffer health complications including pain in their back, hips and knees. And of course, a rider out of balance will negatively affect the horse as well. Jochen discusses the sweat marks and muscling of demo horse Santa Fe ISF, after he was warmed up in his usual tack. Secondly, the shape of horses has changed, with modern breeds trending towards being more “sporty”. As trainers, we want to encourage the horse to lift their topline up underneath the weight of the saddle and rider. But as the horse lacks collar bones, and their entire trunk is hanging from their shoulder muscles, the sheer act of saddling and sitting on a horse causes the topline to be pushed down. Just as one size shoe does not fit all wearers, one size saddle does not suit all shapes of horse, and as the horse develops muscle, even what once fit well may need adjustments. If we want to have any chance of engaging the topline correctly, we must set the horse up to be able to lift. Horses are remarkably tolerant, and most will try to do what is asked of them even if their tack is ill fitting. But we will see the physical effects of poor fit in myriad ways—subtle cues, such as a wrinkle in the nose, pinned ears, and wide eyes are a good place to start. More significantly, we can see severe impacts such as the development of subluxations, sacroiliac issues (like hunter’s bump), swayback, scoliosis, muscle wasting and more. Here, Jochen shows how the human pelvis is meant to be centered over the topline musculature. A well fitted saddle will help prevent these issues, but it must be appropriate for the physique of the horse in question. And we must be cognizant that the shape of the horse will change over time. It is critical that the position and shape of the saddle do not interfere with the cap of cartilage which is located over the top of the shoulder blade. Equally important is that the saddle cannot sit on the horse’s spine. Most horsemen know this, but at the same time, may not be able to accurately assess the true width of the spine; just because the channel is clear doesn’t mean that the panels are as well. Sometimes it is necessary to map out the areas on the horse’s back which can carry weight versus those spots where it simply can’t. Santa at the beginning of the “marking up” process. You can see the bold “X” of two “no pressure” zones. Schleese explained that there are fourteen reflex points in and around the saddle area which cause a negative reaction if they are being pinched from a saddle. Think of a reflex point having sensitivity akin to hitting your funny bone; the response to pressure is involuntary. Some of these points are more sensitive than others; Schleese used the analogies of “lemon”, “grape” or “egg” pressure to help the audience understand the tolerable amount of force on a given area. Clearly, a lemon will absorb more pressure than an egg before it breaks. If these areas are being pinched, riders will likely experience resistance in their warm up for at least twenty minutes; this is the amount of time it takes for the nerves to go numb. These tree points show a design which is common even in modern saddles; they can apply too much pressure to the sensitive region below the withers and near the shoulder cap. Saddle length: The shoulder and loin areas must be non-weight bearing. In addition, the tree must have the same angle as the shoulder of the horse. It is critical to correctly identify the end of the shoulder (usually in line with the end of the mane/front of the withers) and ensure that the saddle is not impeding it. This last point was emphasized repeatedly. Balance: The saddle’s balance point should be parallel to the ground when it is correctly placed on the horse’s back. It is the distribution of a rider’s weight, rather than the actual amount of weight, which is critical. An asymmetrical rider can almost double their impact on the horse. No Rotation/Shifting/Twisting: The saddle should not shift to the right or left when viewed from behind. The tree points must be behind the shoulder blades. Wither clearance: You are looking for at least two to three fingers clearance above the withers, but should also look for two to three fingers on the sides to allow for lateral work. Note here that conformation matters; the saddle will be closer to a high withered horse and farther away from one with mutton withers. There should be no pressure at all four inches below the withers when the saddle is placed on the horse. Schleese says you should be able to take a BIC pen, place it under the D-ring, and then slide it down without resistance. Otherwise, when you add a pad and the weight of a rider, the pinch which the horse feels will replicate the bite of a stallion. Spinal Clearance: This relates to the width of the gullet—you are looking for 3-5 fingers here, enough to ensure that the saddle isn’t interfering with the spinous processes or the musculature of the horse’s back. Billet Alignment: The billets should hang perpendicular to the ground, and the girth should be centered, not tipped forward or backwards. The girth will always position itself at the narrowest point of the rib cage, behind the elbow. Horizontal Panel: The panels should touch evenly on the horse’s back, all the way down their length. Avoid “bridging” or rocking, which distributes the pressure unevenly, causing the horse to hollow their back. Tree angle: The tree angle should be parallel to the shoulder angle when the saddle is positioned properly. Tree width: The tree must be wide enough to allow for shoulder rotation, especially when jumping, but not so wide that the saddle rocks or sits on the withers. Most owners are familiar with the concept of narrow, medium or wide trees, but not that the angles of these trees can vary. This explains why a medium width tree in one saddle might not fit the same as one made by a different manufacturer. Note the angle of the tree points. There are two styles of saddle fitting: static fitting is done while the horse is still, while dynamic fitting considers how the horse moves as part of the fitting process. “You must bring your horsemanship and common sense with you,” says Schleese. Dynamic fitting can give the saddle expert more information. Schleese likes to watch the horse move on the longe line at the walk with no tack; he watches the horse’s eyes, ears, and mouth, as well as the manner in which they carry their topline. In particular, he notes the tail carriage, which is essentially an elongation of the spine. How the horse carries their tail is a reflection of the way in which they have been trained. Most horses carry their tails to the left (and interestingly, their manes fall right). “When the tail goes to the left, they will track up more easily on the left side,” says Schleese. Schleese next will watch the horse with a rider on board, wearing their saddle as positioned by the rider; he notes that dressage riders tend to set it too far back while jumping riders tend to set too far forward. When mounted, the horse should still track up evenly and the loins should remain soft and supple. Within eight circles, the horse should begin to salivate and chew the bit. While it is normal for the saddle to shift slightly away from the direction of the horse’s bend, it should not move dramatically. Often, issues are more subtle. For example, a saddle which is jamming into the horse’s back on the right side of their spine will cause their tail to swing left. Schleese’s mission is to educate as many equestrians as possible on the essential elements of saddle fit. It is clearly a complex process which requires practice to master, but by reviewing the basics, any horse owner should be able to do a basic evaluation on their own saddle to determine if expert guidance is required. As a New Englander, I have had rather minimal exposure to the western discipline; as they say, I know just enough to be dangerous. In fact, it is mostly through my experience as a board member of the Intercollegiate Horse Shows Association (IHSA), which offers both hunt seat and western competition, that I have acquired my limited knowledge. It is also through the IHSA that I had the opportunity to meet the talented and hard working Kelli Wainscott, coach for the Mt. Holyoke western IHSA team. This past March, Kelli organized a benefit clinic at Clark Performance Horses in Winchendon, Mass. in which participants got to “ride a reiner”. Instruction was provided by Karen Clark, who grew up riding English but transitioned over to the western disciplines as a young adult. I have not so secretly wanted to try out reining moves but had always figured that it would be rude to just call up a reining trainer and be like, “hey, so I want to come ride one of your highly trained horses. I don’t want to do this full time, I just want to ride a spin and a slide. Is that cool?” Well, this sounded like my chance to do just that! As an added bonus, I could help the Mt. Holyoke IHSA western team fundraise for their trip to the semi finals at the same time. Karen is explaining something to us with great animation. Also, taking cell phone photos while on horseback in the cold is not easy. I have been intrigued by reining since first watching it in person at IHSA Nationals in 2011. Seeing the reining there was like listening to someone speak a foreign language; the rules were undecipherable to my English-trained mind and I watched intently for any discernible pattern or predictability to the scoring. To me, all of the riders and horses looked great, and I didn’t understand why sometimes a team would receive a “zero” score after doing what looked like the same thing as everyone else. Cheering is encouraged, but I could tell that the cheers were intentionally timed, and when we tried to get into the “wooping”, we never managed to do it when everyone else did. So I packed up my English paddock boots, half chaps and Charles Owen helmet and made the drive out to western Massachusetts under cloudy gray skies. As the miles on my GPS ticked down, I felt a pit of nervous energy grow in my belly. I suspected I would be the only full time English rider there (I think I was right in that), I knew no one other than Kelli, and I began to worry about upsetting the owner or the horses with my lack of experience. But I needn’t have worried. Karen set me at ease with her cheerful personality and positive attitude. She was so extremely patient and answered the groups’ numerous questions with a smile, despite the fact that we were the second three hour group on a chilly March afternoon. Karen assigned me to a sweet chestnut Quarter Horse mare named Whiz; her delicate ears and sculpted face are extremely feminine…I do love a good mare! As Karen’s assistant handed the reins to me, she mentioned I would probably need to take the cinch up a hole. A rider from the MHC IHSA team was kind enough to show me the mechanics of a western cinch. So began the afternoon—foreign tack, foreign aids, and foreign language. Who knew that after thirty plus years of tack time, it was still possible to feel so completely beginner? Once the group was mounted up, Karen gave us a few moments to get acquainted with our mounts. Whiz is sensitive and “well broke”; she certainly knows her job. After watching a few moments, Karen called me over. “I think you’ll like her in some spurs,” she said. I don’t know if Karen had been watching to see how well I rode before offering the spurs, and I don’t know if I was given them because I had positively impressed her (in the sense of having good control) or negatively (in the sense of, gosh, she is hopeless and without these spurs she’ll never get anything done.) She came over and affixed to my Dublin paddock boots the largest set of spurs that I have ever worn in my entire life—they were full on western horseback riding spurs: thick, engraved, spangly, roweled. The kind that jangle when you walk. Disclaimer: What I write here I share with the intent of introducing other unfamiliar English riders to reining, but it is colored through my fairly inexperienced lens. Any mistakes or misunderstandings are wholly my own! Reining patterns are comprised of a set of movements: big fast circles, slow small circles, spins, lead changes and sliding stops. These movements can be combined in various sequences, and for some movements, there are extremely specific requirements. For example, spins must rotate for an exact number of turns, and a spin which is under or over rotated will result in a penalty or elimination. Cheers can be used to help a rider know when they are approaching the end of a specific maneuver or pattern element. Karen started us off with riding big fast circles. One at a time, we tracked left at the end of the ring, practicing keeping the inside leg off the horse (which is incredibly hard to do when you are used to having it on all the time) and encouraging our horses to fly around the circle. As it turned out, many of the riders in my group, while experienced at western riding, were also reining rookies. As pleasure or equitation riders, they were more accustomed to slower paces and staying fairly “poised” in the saddle, while reining encourages looseness (not sloppiness) and speed. When it was our turn to try, Whiz was, well, a whiz. She clearly loves to run and it was quite freeing to just zoom around the circle. I trusted Whiz from the get go, so much so that when someone suddenly opened a small door on the side of the ring, I didn’t tense in anticipation of a spook, as I would have with my own horse. When on the job, Whiz is all business. She was so comfortable to ride, and I was having so much fun, that I hardly noticed when the left stirrup came unclipped and fell off my saddle. It was another lap before I recognized that it was missing and stopped Whiz so it could be reattached. Whiz and I are watching a group mate practice their circles. Part of the criteria for these movements is that the circles should actually be round, and trainer Karen frequently had to remind us to keep our eyes up and frame the circle evenly. I guess riding a round circle is a challenge no matter what discipline you ride! Once each rider had a chance to practice the circles, Karen taught us about spinning. The spins and sliding stops are, in my opinion, the two most dramatic reining movements, and the Quarter Horse’s genetic ability to sit down on their hindquarters and coil their body like a cat is just one more example of the physical manifestation of the term “horse power”. In reining, a horse should spin a set number of times (as specified by the pattern), and like a dancer, the rider needs to keep their head spinning in order to stay centered and “spot” their starting point. If the spin is over or underrotated, there are point penalties up until ¼ of a turn; if the rider misses the mark by this amount or more, then the pair is eliminated. Karen had us start from a halt, choosing a point out in front of our horse’s ears to use for focus. To go left, you just had to step into the left stirrup, slide the right leg back a touch, then shift the rein left, giving a bump with the right leg. To go right, the rider reverses all those aids. To stop, the rider brings the rein back to center. The entire movement is done with forward intention but the horse should be pivoting in place around one hind leg. When I asked Whiz to initiate the first spin, I thought for a moment I was going to tip right off her side! She lowered her neck and shoulders and sunk into the movement in a manner which I both expected but was somehow not ready for. Then it felt like we were going about a million miles an hour—but when I watched the video afterwards, Whiz is clearly spinning with a “oh boy got a rookie here” level of energy. There is clearly much more power available in this creature! After most of us were left feeling “well spun”, Karen allowed us to try out that most iconic of reining moves—the sliding stop. This was definitely the movement I was most excited about! We came down the quarter line on the left rein; just like my dressage horse might anticipate a leg yield, Whiz knew instantly what this turn meant. The key to a good sliding stop is to build the energy in the hindquarter, holding the horse back from their full run at first so that they don’t fall onto their forehand, then releasing all of that stored power. A good slide requires that the horse is thinking uphill. Karen coached us to hold the horse until we were about half way down the long side, and then let them RUN. Whiz sure knew how to take this cue and the feeling of her haunches dropping down and driving into the surface was a form of horse power I’m not sure I have felt before. The fact that we were running at top speed directly towards the wall, on purpose, made it slightly disconcerting; this is the type of situation I am usually trying to avoid. And the especially hard part is you are supposed to actually let your hand go forward (which I can see in the video I failed to do, and in addition, I was holding the horn). The slide happens when the rider sits back and says “whoa”. When I gave the cue, Whiz’s hindquarters dropped away while her withers lifted up. It feels like the ultimate “throw down.” It is supremely cool. Despite some of the similarities, I don’t quite agree with the notion that “reining is dressage in western tack”. It is its own “thing”. The similarities are the kinds of things which I believe all horse sports share, concepts like “the horse needs to be well balanced” and “the horse needs to engage the hindquarter”. Karen told us that good reining horses have a short career because they get too smart and start to anticipate all of the moves, leading to the kinds of mistakes which cause elimination. There are no “levels” in reining—from the beginning, all tests include all of the movements. English dressage is a progressive system of training with the goal of enhancing the natural gaits of the horse. While a dressage horse can certainly start to learn a specific test, ideally there is enough variety and change in the movements that it is possible for them to have a long, progressive career. During our session, Karen rode a client’s green horse, who was working in a snaffle. Most of our “finished” horses were in a curb, though one was in a bosal/hackamore. In western riding, the use of a curb bit is the mark of an experienced, well-educated horse. I guess this is similar to the way in which an upper level dressage horse is able to be ridden in a double bridle for greater clarity of the aids and improved engagement. Probably in both disciplines, there are trainers who use the curb fairly and those who only use it to achieve forced submission. But when either of these tools is used fairly, the communication between horse and rider can be lighter and softer. Most eventers are familiar with the concept of a “combined test”, in which the same horse and rider do dressage and show jumping, or a derby cross, which is a fusion of the jumping phases. At this clinic, I learned about a competition called “working cow horse”, which Karen said was a great outlet for a horse which understands the requirements of reining but lacks some of the necessary pizazz to be a real reining specialist. In this competition, riders first complete a reining pattern, and then when they indicate they are ready, a cow is released which the horse and rider must then “box”, meaning they move the cow along the fence and hold them there. At more advanced levels, the horse must also “work” the cow by making them move in a circle, with the horse on the outside. I thought it was interesting to learn that western riders have their own version of “combined test” in the working cow horse competition. Overall, my “ride a reiner” experience was just what I had hoped it would be—a fun afternoon exploring an aspect of the equestrian world which I previously had known little about, and a chance to check off one of my “equine bucket list” items. I also have to think that those of us in other disciplines could be smart to take a page out of Karen’s notebook and offer introductory clinics to our discipline. How else are riders without access to horses trained for specific disciplines ever going to have the opportunity to try out something new? Who knows how many riders have gotten the “reining bug” after doing a clinic like this one? It is so easy to pigeonhole riders into one discipline and make assumptions about what and how they must ride and in so doing we create divisions in our equestrian community which do not need to exist. I am so grateful to organizer Kellie and our patient teachers Karen and Whiz for offering us this opportunity. In late April, my friend Bethany shared a quote from Vonnegut which really resonated with me. I will loosely paraphrase here; Vonnegut contends that the reason we are often so frustrated with the weather in March and April is because we are falsely under the impression that it is spring. Instead, Vonnegut identifies six seasons, not four: January and February are still winter, but as nature wakes back up in March and April, this is not actually spring, but rather “unlocking”. Spring doesn’t actually happen until May and June, while summer hits in July and August and autumn in September and October. Then in November and December, another transition–“locking”, when nature and all of its creatures shut down, store up and settle in for the depths of winter. The barn cats took over one of the horse stalls. They are not impressed with winter either. Lee is making sure that I am aware that I have neglected to hang her hay bag. The calm before the late March blizzard. April (SPRING) “I mean, it is pouring sideways, and the mud is now almost over the tops of my wellies, but the calendar says spring, right? So maybe I can start to ride?” It should be noted here that roughly 75% of the arena is still covered in snow and ice. The riding arena in late April. They left the browband and reins alone; these were from a different bridle and evidently less tasty leather. A close up of my mouse-devoured bridle. Oh spring. All winter, I yearn for it, for the return of fair weather, better footing, all my horses at home, and longer days with sunlight from the earliest hours of the morning until late evening. But somehow the initial reality never quite lives up to my ideal. Spring arrives with excess packaging: mud, tons of winter hair, lost muscling, and dust on all my gear despite efforts to keep up with cleanliness during the off season. And the worst part, for me, is the equine behavior. In order to get to the blissful days of summer, without fail, this next phase cannot be skipped. I call it DE-FERALIZATION. Like children who have been on summer vacation for too long, I find the first few weeks of transition from winter break to being working animals brings out some of the worst characteristics in my favorite equines. I brought Anna home from the indoor on April 1. While I am SO grateful for having the ability to keep her close to home at a well maintained facility, I was also SO ready to bring her back. I knew that the first few weeks of April would be dicey as far as serious work went, so I was prepared to give Anna a few weeks’ light work upon her return home; hacking, light ring riding as the footing permitted, maybe some work in hand. Anna’s first hack at home was with Marquesa; it was the older Morgan’s first ride since last year. Now 22, Marquesa has always been an old soul. Spooking just isn’t her thing; high necked Morgan alertness, yes, but spinning, wheeling, bucking, etc., nope. We thought we would take them for about twenty minutes across the power lines and around the back field, just a short walk to stretch legs. Spring is at least good for some stunning sun rises. This is Izzy. We didn’t make it out of the backyard. I mean, everyone stayed on, but between the squealing and jigging from Anna and the snorting and blowing from Quesa…well, we considered the safe return to the barn after about ten minutes to be a success. In early April, I bought a round pen. My ring is only partially fenced and given that Izzy is turning three this year and we might want to THINK about backing her at some point, I figured that a more complete perimeter was a good idea. We set it up mid-ring, straddling the snow which still covered half the arena. Rabbit, the polydactyl/slacker barn cat who did NOT catch the mouse who ate my bridle. To my surprise and delight, Lee was completely civilized in the round pen. I started by just walking her—forced marching for 20-30 minutes with frequent direction changes—and she was so compliant and calm that I ended up just unclipping the line and practiced moving her around with my body language. Compared to the others, I think she has lost the most condition this winter. But at the same time, she is mostly Thoroughbred, and once she gets into work, she tends to come back to fitness fairly quickly. Lee’s first ride of 2018, sporting her stylish new biothane bridle. Feeling overly ambitious, I also signed Izzy up to go to an in hand/ground work clinic with Tik Maynard in early May. I have heard Tik speak and read his articles, which all have impressed me, and I thought the opportunity was too good to pass up. But I knew that Izzy may have forgotten some of her lessons from last year after a winter off, and we had to be diligent about reviewing the basics. In addition, she taught herself a new skill this winter—how to buck—and though the bucks are without any malice and are performed with just the sheer joy of being young and agile and quick, I was less pleased with this addition to her repertoire. My helmet became constantly planted to my head and Izzy tested my determination to prep her for the clinic on an almost daily basis. Then on April 15, it snowed. Again. In order to get through the De-Feralization, what is needed is consistency. And between the weather, the footing, and my work schedule, what I didn’t seem to be finding was the one thing most necessary for success. So this year, instead of getting overly frustrated during this time of transition, I tried to practice a different mantra: We’ve been through this before. We take baby steps. We always get through it, and once we do, the reward is worth the few weeks of challenge. This is perhaps the time of year beyond all other where we must simply acknowledge that patience is also a skill which requires practice. All you can ever do is your best, take small steps, and reward any forward progress. Julia and I try a mounted selfie. Yes it is May. Yes I am still wearing a down vest. Instead of being upset with myself that my work schedule wouldn’t permit me to give 110% attention to each horse, I divided my time. I recruited some helpers, who came to hack with me (thanks Julia and Nikki! ), allowing two horses to get attention at once. I became satisfied with shorter work sets—even just 15 minutes for Izzy—knowing that a little was better than nothing and in time, we would build on this small foundation. Now, on the cusp of June, I am finally enjoying truly glorious spring weather, with mostly compliant horses who have a baseline of fitness. De-feralization is complete, and true spring has officially arrived. Rabbit and Smokey are back in their usual “spring spot”. c 2016 Trafalgar Square Publishing, North Pomfret, VT. 163 pages. If you have read any of my previous reviews of Klimke’s work (including her updates and revisions to her father’s original texts), it is no secret that I am an uber fan-girl of Ms. Klimke and really idolize the focus, talent, compassion and effectiveness she brings to her horsemanship. The fact that she also is a mother and wife, writes books and articles and seems to sometimes to also take vacations only adds to her superwoman status. So it is with the utmost respect and honor that I say that this particular book was not my favorite out of all of the Klimke collection. That is not to say that it is a bad book. It just feels rather…unfocused. In less than two hundred pages, readers get an overview of her principles for training, a snap shot of each phase of work (broken down by warm up, each gait, cool down, cavalettis, etc.) and then offers a brief profile of each of her ten competition horses, revealing their specific training protocols based on their strengths, weaknesses and personalities. We also cover her mentors, support team, and preferred tack. It is a lot of content, and a broad range to cover, and I guess based on the title that is what the reader should be expecting. The problem I had is that, after having read her other books, this one just seems to gloss over the most important concepts. I guess it isn’t possible to take the deep dive into a particular facet of training that we do when the whole book is dedicated to that particular topic; in Cavaletti, for example, Klimke is able to break down the steps to introduce cavaletti to a horse, and then details the systematic increase in demands which one can place on the horse through the use of ever evolving cavaletti and gymnastic exercises. I was inspired to build these cavaletti and incorporate their use more into my horses’ training after reading Klimke’s update of her father’s book. I try to set up a new arrangement each Monday. With all that being said—for someone who is looking for more of an overview to Klimke’s system, this book will certainly grant you that. It is wonderfully illustrated—the woman seems incapable of taking a bad picture—and each photo shows a joyful horse, well presented. Klimke’s tone is one of modesty and humbleness; she is always a student of the horse. Klimke, who was awarded the title of Riding Master by the German Equestrian Federation in 2012, says that to do justice to this status, “I train further, question myself, consider the views of others, and remain open to all riding styles. Anyone who cares to be a good rider must first of all work on herself: on her inner bearing, her general attitude toward horses, her physical readiness (of course), and on giving aids clearly and “with feel” for the horse” (Klimke, 2016, p xiii). In my opinion, this is an attitude which more American trainers would be wise to embrace. As always, I still took away pearls from Klimke. For example, Klimke’s horses are all turned out every day, sometimes in groups—even her top mounts. It is an important part of their program to maintain their mental and physical health. “To me, it seems obvious that performance horses should be kept in the way that is most appropriate to their species. This means, they get to move freely every day, whether in a paddock or out at pasture. They need social contact or their herd, in order for them to feel safe and well….In my experience, horses that are turned out regularly rarely hurt themselves” (Klimke, 2016, p. 30-31). Each chapter heading begins with a summary which is excellent in its brevity and clarity; it is like a little nugget which you could read before you ride just to keep your focus sharp, or pin to your computer to meditate on when taking a break from work. For example, in her chapter on “The Warm-Up Phase”, Klimke writes, “Take enough time to warm up and come together with your partner. This goes for horses of any age and is important both physically and mentally” (Klimke, 2016, p.56). Mastering the perfect warm up is an ever evolving process. Anna, in December of 2016. One of the other aspects of this book with I appreciated was the credit which Klimke gives to her own mentors and coaches, all of whom she considers part of her team and a critical key to her success, as well as her grooms, stable managers and equine health support team. She expresses gratitude to and offers credit to her horses’ owners for remaining steadfast through the inevitable ups and downs of the training process, and also acknowledges the support of her family. No one can reach the kinds of lofty aspirations which Klimke does without such a network, and it was quite refreshing to get a glimpse into that world for this rider. So if you are interested in sweeping overview of Klimke’s approach to developing her horses, this book would be a great place to start. I know that some sections of the book are already out of date (for example, in 2017, Klimke retired one of her rising stars, SAP Escada FRH, due to injury; she describes Escada in the book as “absolutely the best horse I have had under saddle to date” (Klimke, 2016, p. 121)), but for most readers, these factors will do little to detract from the rest of the content.